Oh boy, I'm so pumped about how this project turned out and I want to share the details with you so you can get busy making your own GIANT artwork.... Cause, who doesn't want GIANT artwork in their house? Here's the scoop. I'm staging a gorgeous model home in a brand new, modern condo building that has a lot of large white walls. I'm really digging the white walls, and in an effort to keep the clean lines and minimal modern decor, I really wanted some BIG artwork for the walls. But, you know the thing about BIG artwork... It costs the BIG dollars! So, I needed to come up with a solution. My friend Erica over at Designing Vibes recently shared a tutorial for making oversized wall art for $50 by building a frame and wrapping it with tapestry. What a genius idea! You should definitely check out her post on it! She has other great posts for making awesome designer upgrades in your home, DIY style. She's awesome. Erica was inspired by a project that was done over at House of Jade Interiors. They built a frame and wrapped it with a fun shower curtain print! I love the internet and all of these creative bloggers who take the time to share their awesome ideas with everyone. So basically, I'm just copying them! The only thing that I did different was make a burlier frame, wrap it with a sheet first, then wrap it with a tapestry that I bought from Society6. So, if you want the easier tutorial, you should definitely go with the other bloggers. But, if you want to go the extra mile and complicate your life like I do, then follow along here. I basically decided to make a legit artist frame, like something that you would wrap in canvas for a painting. I was afraid that if I didn't beef up the frame enough, that it would be flimsy or the wood would twist over time. 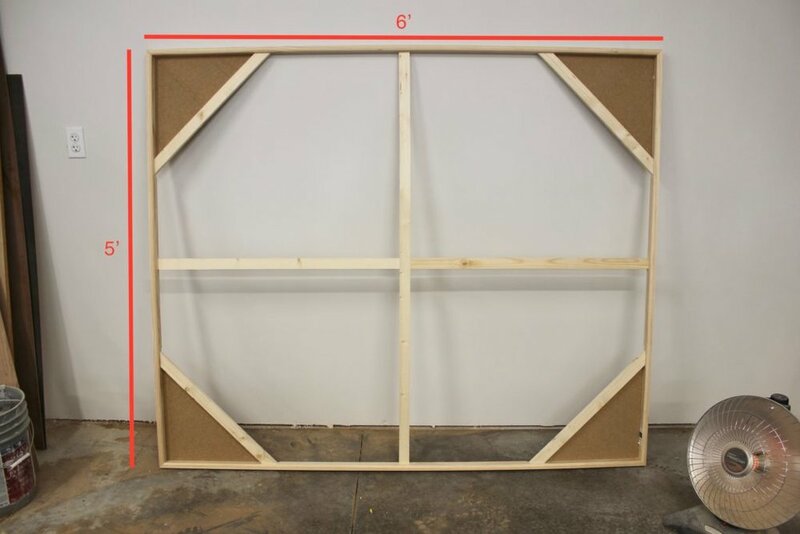 Have you ever had or made a painting on canvas and the frame won't lay flat on the wall? It's super annoying! I actually made 2 of these frames. This is the art that I chose. You can click on it to be redirected to the website where I bought it. 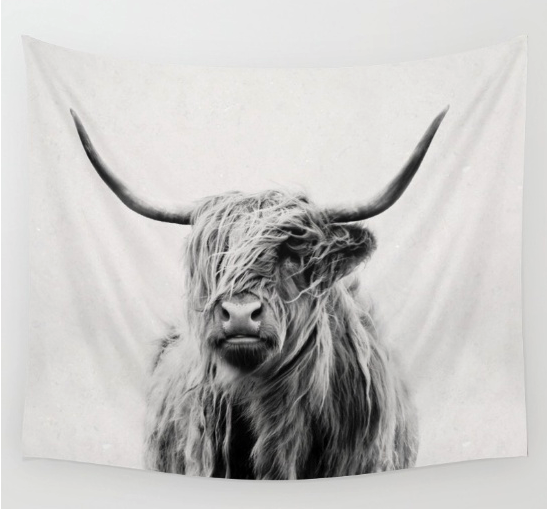 You guys, here's the thing that I love about Society 6... They support artists! Read what Society6 has to say about their business model. Ok, I'm going to start out of order, kind of.... Here is a photo of the frame that we built. First thing we did, was router the 1x2 that was going to be the outside frame. 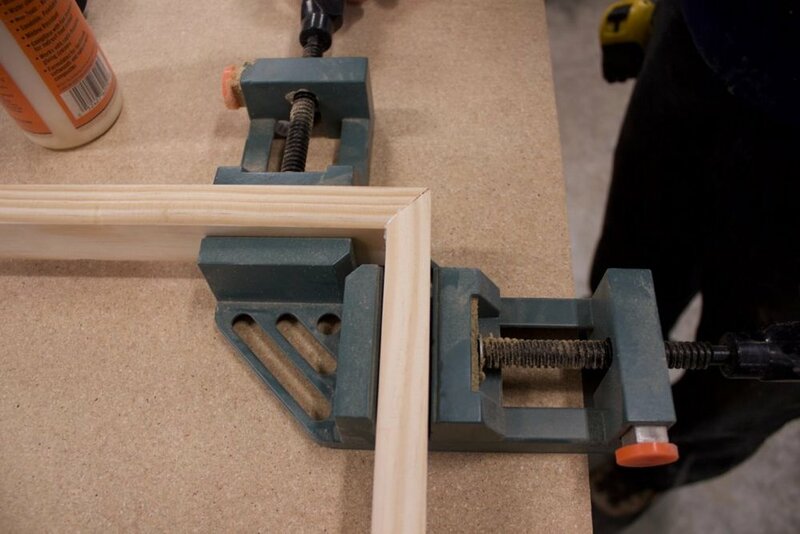 If you don't have a router, you can definitely use a table saw to bevel the length of the frame. It would look something like this. We used a router because you don't have to sand the material after. 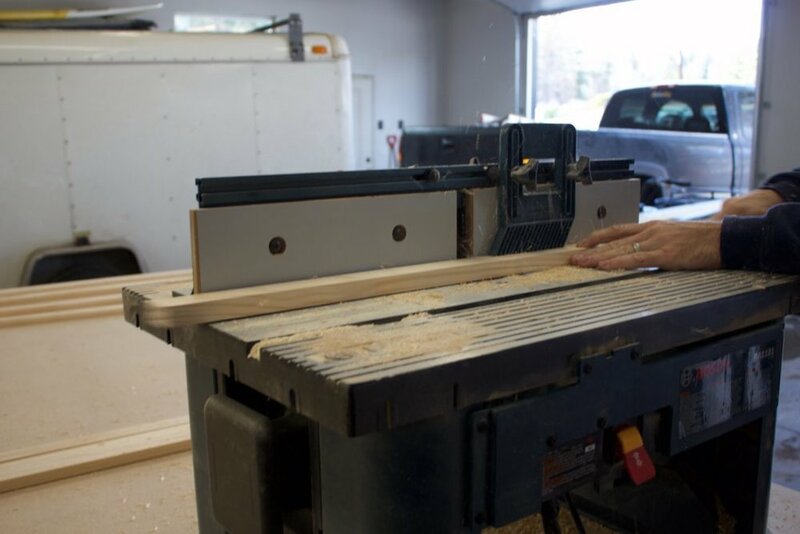 If you should make a bevel with table saw, then you will want to hit it with a sander after you built the frame. 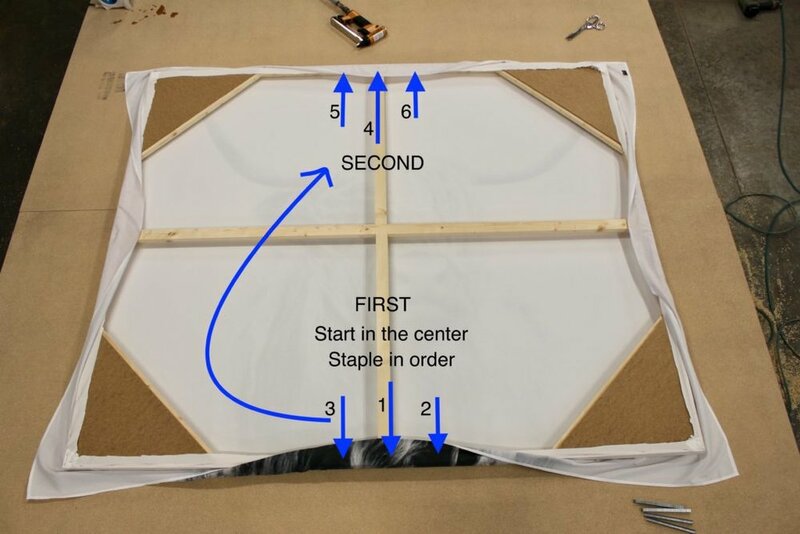 The whole purpose of this step (which technically you could skip) is that it will help the fabric lay flat over the frame so that the wood doesn't show through on the outer edges. Next, cut your material to length with mitered corners. We cut 2 pieces, 6' long and 2 pieces, 5' long. Then we glued the mitered corners and put it in a 90° right angle clamp. We nailed the corners with a pin nailer (brad nailer). The rounded or beveled edge faces the inside of the frame. 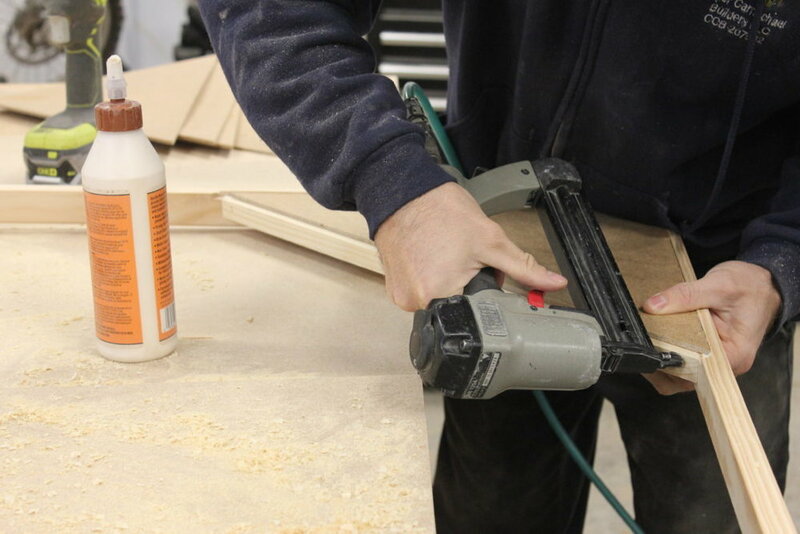 Once all four corners were glued and nailed, we made corner supports out of hardboard to provide sheer strength. Forgot to photo this step. 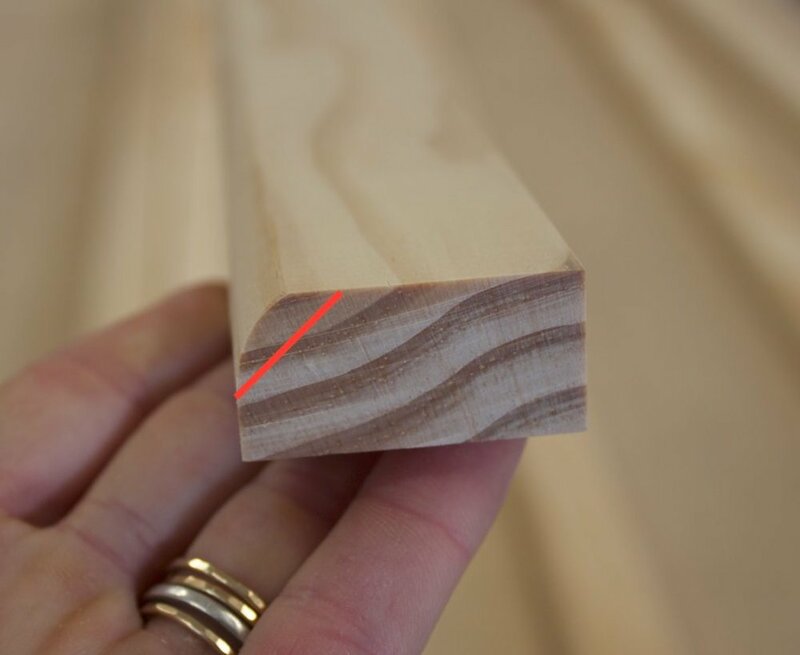 Basically, cut the board with table saw or circular saw in the center (red line). Then cut diagonally. I made 2 frames, so I needed 8 triangles. Only 4 are needed per frame. Then glue and attach those triangles to the BACK side of the frame with pin nails by overlapping the two outer triangle edges about 3/8". Since I had Peter helping me, and since he loves to do things the BEST way, he routered out a groove for the triangles to sit in. I'll show ya, but don't feel obligated to do it! I promise it won't affect the stability of your frame if you just nail it to the outside(in the exact place that we placed ours). But, if you're a tool junky, then go for it! Be sure to glue the edge under the triangle. 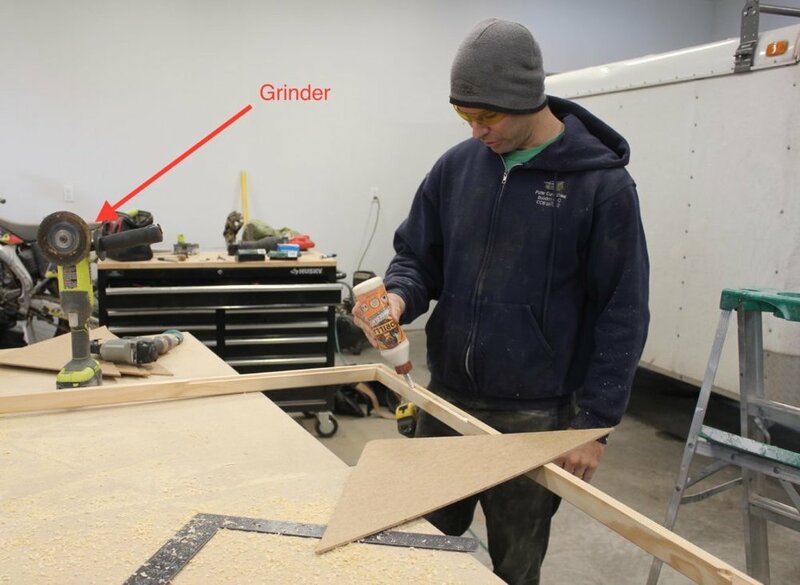 Peter used the grinder to round the corner of the triangle to fit it into the routered corner. Now it is time to make the corner braces that will go under the inner edge of the triangle. Glue and nail in place. The cross brace is the final step in the actual frame building. Cut a 1'x2' to fit perfectly between the outer edges. Nail from the outside to secure the brace flush with the back of the frame. Now, measure for 2 separate supports(blue and red lines) to fit between the inside of the outer end and the cross brace. Use a pocket hole or angle bracket to secure these two pieces to the outer frame and the cross brace. I just want to mention, because I don't know if I was clear enough about it, but ALL of the bracing and supports should be flush with the BACK of the frame so that the wood doesn't show through or touch the fabric. Now comes the tricky part, in my opinion. The wrapping of the tapestry. First you will wrap the full size white sheet on the frame, so you will get a little practice. You will need a staple gun to do this. Lay the sheet wrong side up on a flat surface and put the frame on top of it, also wrong side up. I ironed the sheet first... And the tapestry for that matter. You're going to have to forgive me right now... I didn't take pics of wrapping the sheet! But I promise, you do the SAME EXACT thing with the tapestry. So, this next set of steps you will do twice! Once with the sheet, then start all over again with the tapestry. Here is what it looked like with the frame wrapped with the sheet, and the excess fabric cut off. Staple in the center of one side and then once again on each side of the center... Numbered below. Then, go across to the opposite side of the frame and do the same, pulling the fabric gently... Not too tight. You don't want a lot of tension, but you want it taught if that makes sense. Here is a visual of the stapling pattern. Now, do the same thing, but on the sides. This is how you are going to work it. Adding a few staples, and moving across to the opposite side until you eventually make it to the corners. Then... Same thing on the sides. By the time you get to the corners, you just make a fold, like wrapping a present. It should look like this. Then, put a few additional staples in the back to help the back lay flat. All you have to do now is figure out how you want to hang it. It is actually quite lightweight. I just used 2 small D-ring hooks on the back of the top frame. I figured out where I wanted to hang the art on the wall, found the studs, and attached the hooks so that they would line up with the studs. I love how these turned out and have gotten a lot of positive feedback! But, if this seems too challenging, I have another idea that might be a simpler solution for displaying affordable big art work... Click here to be redirected to a tutorial on how to sew a rod pocket on a tapestry and display it from curtain rods, or a rod of your choice... For less than $50! It'll look something like this. Love ya! Thanks for reading friends!